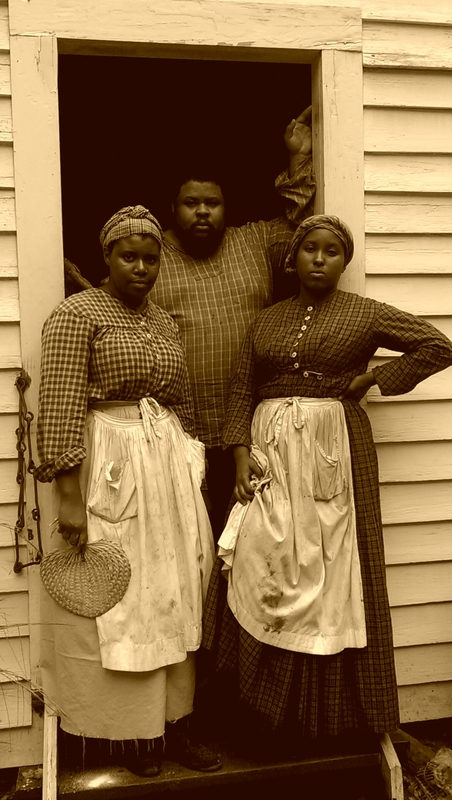 Michael W. Twitty, chef-historian and culinary justice activist, poses alongside his friends Alexandria Sweatt and Jasmine Waters during a visit to the Smith Family Farm at the Atlanta History Center. Photo courtesy of Teya Smith and Michael W. Twitty. In this episode of the Between the Waters podcast, Lee Brockington, Senior Interpreter of History and Culture at Hobcaw Barony, interviews chef-historian and culinary justice activist Michael W. Twitty during his visit to the Waccamaw Neck. Mr. Twitty visited nearby Sandy Island as part of his research agenda for his forthcoming book, The Cooking Gene, a historical memoir of his journey to discover his ancestral and culinary roots. Afterwards, he graciously accepted our invitation to visit Friendfield Village, where he shared how food strengthened familial and community bonds and linked black communities at Hobcaw to a vast culinary heritage in the Atlantic World. To learn more about Mr. Twitty’s project, visit his outstanding blog Afroculinaria.